In an adaptation from his new book Altruism, Buddhist monk and bestselling author Matthieu Ricard takes on the notion that humans have a fixed nature. 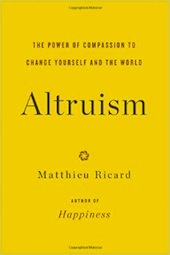 Altruism: The Power of Compassion to Change Yourself and the World (Little, Brown, 2015).” width=”170″ height=”255″> This essay was adapted from Matthieu Ricard’s new book,Altruism: The Power of Compassion to Change Yourself and the World (Little, Brown, 2015). But is this truly the case? We have seen that cultures can evolve. For example, we have gone from regarding torture as an entirely acceptable public spectacle and war as noble and glorious, to tolerating violence less and less, and increasingly regarding war as immoral and barbaric. But can the individual change? And if he can, does this change have an influence on society and on succeeding generations? True, our character traits change little, so long as we do nothing to improve them. But they are not frozen in place. Our basic traits, which result from the combined contributions of our genetic heritage and the environment in which we grew up, make up only the foundation of our identity. Scientific research in the field of neuroplasticity shows that any form of training leads to a reconfiguring in the brain, on both the functional and structural levels. Society and its institutions influence and condition individuals, but individuals can in turn make society evolve and change its institutions. As this interaction continues over the course of generations, culture and individuals mutually shape each other. If we want to encourage a more altruistic society to develop, it is important to evaluate the respective capacities for change of both individuals and society. The scientific discoveries of recent decades show that our genetic heritage, influential as it is, represents only a starting point that predisposes us to showing certain dispositions. This potential—and this is a crucial point—can then come to expression in multiple ways under the influence of our environment and by what we acquire through the efforts we make to train our minds or physical abilities. Thus, it is more appropriate to compare our genetic heritage to an architectural drawing that might be modified as the construction progresses, or else to a musical theme on which a performer improvises. The plasticity of the brain plays a large role in our capacity for individual transformation. For a long time, an almost universally accepted dogma in the neuroscience field stated that once formed and structured, the adult brain doesn’t produce any more neurons and changes only through decline with age. Today we know this doctrine was completely wrong. One of the major discoveries of the last thirty years concerns neuroplasticity, a term that takes into account the fact that the brain changes constantly when an individual is exposed to new situations. The adult brain in fact remains extraordinarily malleable. It has the ability to produce new neurons, to reinforce or diminish the activity of existing neurons, and even to attribute a new function to an area of the brain that usually carries out a completely different function. There is a second mechanism that allows individuals to change: epigenetics. In order for a gene, which we have inherited from our parents, to be active, it must be “expressed,” that is it must be “transcribed” in the form of a specific protein acting on the organism bearing this gene. But if a gene is not expressed, if it remains “silent,” it’s as if it were absent. Recent advances in genetics have revealed that environment can considerably modify the expression of genes by a process called epigenetics. This expression of genes can be activated or deactivated under the influence not just of external conditions, but also of our mental states. Two monozygotic twins, for instance, who have exactly the same genes, can acquire different physiological and mental characteristics if they are separated and exposed to dissimilar living conditions. In scientific terms, one would say they are genetically identical but phenotypically different. Similarly, a caterpillar and a butterfly have exactly the same genes, but they are not expressed in the same way, depending on the times of the insect’s life. These modifications in the expression of genes are more or less lasting, and in certain cases can even be transmitted from one generation to another, even though there are no changes in the DNA sequence of the genes themselves. These discoveries have truly revolutionized the field of genetics, since hitherto the very notion of transmission of acquired traits was regarded as heresy. The influence of external conditions is thus considerable, and we know today that this influence has repercussions all the way down to our genes. Could training the mind to cultivate positive emotions lead to epigenetic changes? Studies undertaken at Richard Davidson’s laboratory in Wisconsin, in collaboration with the Spanish geneticist Perla Kaliman, show that within a day, meditating for eight hours on mindfulness, altruistic love, and compassion already induces major epigenetic modifications. We can glimpse here the possibility of an epigenetic transformation of an individual that is due not just to the influence of the environment, but also to a voluntary training in cultivating basic human qualities. It seems that a simultaneous transformation of cultures and individuals is possible. Children who grow up in a culture where altruistic values prevail and where society encourages cooperation will change no only in momentary behavior but also in their general attitude and mental dispositions. They will be different, not just because they will conform to new cultural norms and new rules set by institutions, but because their brains will have beens shaped differently and because their genes will be expressed differently. Thus, a dynamic process of mutual influences will continue over the course of generations. In the final analysis, it is individuals who put totalitarian regimes in place, and other individuals who overthrow them to establish democracy. It is individuals who have perpetrated genocides when they dehumanized their fellows, and it is other individuals, sometimes the contemporaries of the former, who promulgated the Universal Declaration of Human Rights. Despite immense progress in the fields of democracy, women’s rights, human rights in general, justice, solidarity, and the eradication of poverty and epidemics, much remains to be done. It would be regrettable to neglect the role of personal transformation in facilitating further changes. One of the tragedies of our time seems to be considerably underestimating the ability for transformation of the human mind, given that our character traits are perceived as relatively stable. It is not so common for angry people to become patient, tormented people to find inner peace, or pretentious people to become humble. It is undeniable, however, that some individuals do change, and the change that takes place in them shows that it is not at all an impossible thing. Our character traits last as long as we do nothing to improve them and we leave our attitudes and automatisms alone, or else let them be reinforced with time. But is is a mistake to believe they are fixed in place permanently. Adapted from Altruism. Copyright ©2015 by Matthieu Ricard. Translation copyright ©2015 by Little, Brown and Company. 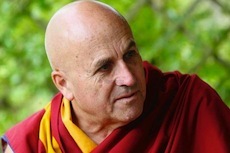 https://www.mindfullifeprogram.org/wp-content/uploads/2015/08/MATTHIEU-RICARD.jpg 630 1500 John https://www.mindfullifeprogram.org/wp-content/uploads/2017/01/Mindful-Life-Stacked2-w-tree-1.png John2015-08-25 13:54:552018-10-06 10:18:55Can People Change? Inside Out revolves around the life an 11-year old girl named Riley, who is moving across the country with her family. At such an impressionable age, a move is a huge transition, and she experiences an outpour of emotions as she leaves her home, friends, and hockey league behind. Enter the main characters, Riley’s feelings: Joy, Sadness, Anger, Fear, and Disgust, who provide a glimpse into the workings of Riley’s mind as she navigates this life-changing experience. From the moment it started, I couldn’t contain my excitement. The nerd in me was blown away by the extraordinary way in which many of the movie’s messages “measured up” to reality from a neuro-scientific perspective. For example, the way a day full of short-term/working memories is then consolidated during sleep. While the film gave up some scientific integrity for the sake of storytelling, its poetic license didn’t drive too far away from the reality that we are, essentially, made up of personality traits that wax and wane during different points in our life. Beyond the intricate science of it all, what Inside Out did do so well was to provide the empowering message that we should learn how to understand, connect to, and accept our feelings and memories in a way that is conducive to thriving. Emotions are neither inherently good or bad, and to think of them in such dichotomous terms is to do yourself a disservice. Every emotion tells us something about our inner experience that might be informing our outer experience. In fact, Rumi, the Sufi poet, waxed poetic in “The Guest House” a long time ago about how we should treat every emotion as a visitor, without looking to get rid of any of them, and instead work to understand their message and purpose. What Rumi alluded to in his writing was also recently confirmed by research that indicates that well-being is actually predicated on having a wider range of emotions. The more you can feel—in all of feeling’s iterations—the better off you are. At one point in the film, Joy tries to keep Sadness away from Riley. Although she felt other emotions, the inability to feel sadness, coupled with her mother’s request for Riley to stay happy, ultimately lead to a cold and numb existence. This state only generated poor judgment and unhealthy choices. It wasn’t until she felt sadness that Riley was able to see more clearly and reach out for support. Acknowledging and understanding emotions is much healthier, productive, and adaptive than ignoring their importance. Just like our present reality is seen through the framework of our past experience, the memories we look back on are colored by our present-moment experience. In Riley’s case, she recalled a championship hockey game several different times during the movie. At one point, she remembers missing the winning shot and feeling sad about it. At another point, she literally remembers the same moment, but this time, she recalls smiling as she is championed by her teammates who pick her up onto their shoulders to let her know how valuable she is to the team. Same memory, the only difference being that it was recalled through a sad lens, and then through a joyful lens. This is a very powerful idea. What we really “need” to remember is that our memories are a part of our personal narrative, and that in many ways, we construct the narrative we believe. Because we create the narrative, we can change our story at any time. We can’t delete certain paragraphs that contain with negative facts and daunting realities. We can’t cut out chapters that we would rather not have had—they will always be there, and that’s okay. Research suggests that the actual experiences we have are less impactful than the story we tell ourselves about them. Probably the most remarkable part of the movie is its existence as a film that focuses on emotions. As long as more than a modicum of scientific integrity exists, what’s important is that an illustration of the concept of emotion can now impact the dialogue we have with our children. If children learn earlier on to embrace the way they feel, and that it’s crucial to feel all of their emotions, we can hope to see more adjusted adolescents and adults. Really, though, animation aside, this movie’s target audience is feasibly all of humanity. Why? Because to have the language to talk about our emotions, in all of their iterations, is to be empowered with an ability to learn from them, to respond to them with the utmost of compassion, and approach them with less judgment. Pixar knew what it was doing when it used 5 scientifically validated universal emotions, stemming from Dr. Paul Eckman’s work (the 6th universal emotion is surprise). Through Eckman’s research, he showed that certain emotions are felt and expressed through universal facial expressions across cultures around the world. And so, the movie reminds us of our intrinsic humanity, how similar we all actually are despite our differences. This is a very powerful idea, especially in the wake of discriminations based on skin color and/or gender/sexual identity. At the end of the day, no matter who you are, you experience the capacity for the same range of emotions. Therefore, if we can realize that we are all just fighting our own hard battles, we might experience this world with more compassion and less judgment. This post is adapted from BrainCurves.